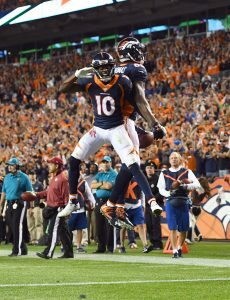 As expected, Broncos picked up Emmanuel Sanders‘ $1.5MM option on Monday, according to Mike Klis of 9News (on Twitter). With that, Sanders has $1.5MM fully guaranteed on his scheduled $10.25MM payout for 2019. For his part, Sanders has said he’s way ahead of schedule in his rehab from an Achilles injury. The Broncos also picked up their option on cornerback Chris Harris Jr. (Twitter link). The option, worth $1MM, will be followed by an additional $7.9MM payout in 2019. Sanders, who will turn 32 on Sunday, recently balked at a potential pay cut. The Broncos, however, did not ask for a pay cut, so that was pretty much a moot point. Thanks to his fast recovery, Sanders should be able to return at some point during training camp. Harris, meanwhile, is entering the final season of a five-year, $42.5MM deal. The contract has proven to be a tremendous value for the Broncos as Harris has blossomed into one of this era’s best cornerbacks. In 2018, Harris graded out as Pro Football Focus’ No. 3 overall CB. An extension could be on the way, but the Broncos first want to see how free agency plays out. 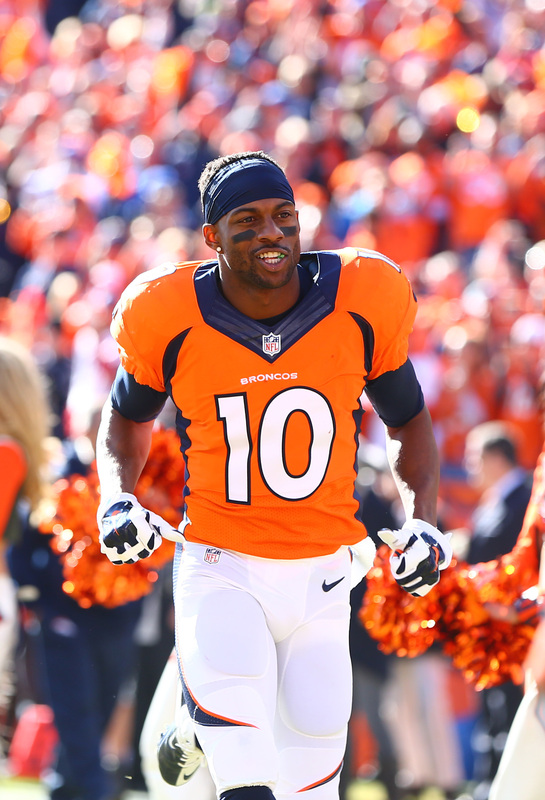 By releasing Emmanuel Sanders, the Broncos could create more than $10MM in cap space. However, they would create a major need at wide receiver by doing so. It does not appear they plan to go in this direction. Vic Fangio said Wednesday (via Ryan O’Halloran of the Denver Post) Sanders is expected to have a major role next season. The new Denver HC also said the Broncos are expected to have Sanders back in the lineup by Week 1. This would be significant, considering the Pro Bowl wideout tore an Achilles’ tendon in early December. John Elway confirmed Wednesday afternoon the team will pick up the options of both Sanders and Derek Wolfe, who has a $1MM option. Sanders, who will turn 32 next month, recently balked at a potential pay cut. The Broncos, however, have not asked for this. They have Sanders under contract for one more season — at $10.15MM — and have a $1.5MM option to pick up soon. This looks set to happen, and Sanders will continue his rehab with an apparent goal of returning some point during training camp. Demaryius Thomas‘ longtime running mate is the final skill-position player remaining from the Broncos’ Super Bowl champion team. The Broncos traded Thomas at last year’s deadline, with his contract more expensive than Sanders’ and the latter having surpassed him as the team’s No. 1 option — at least during the 2018 season. Sanders was on pace for more than 1,100 receiving yards before going down in early December. Denver lost Sanders and Chris Harris within a span of four days, and its three-game midseason win streak gave way to a four-game, season-ending skid. Denver drafted Courtland Sutton and DaeSean Hamilton last year, and UDFA Tim Patrick showed promise. But the Broncos are, barring something unexpected, planning to have Sanders around for the start of Joe Flacco‘s tenure. The Broncos have yet not approached Emmanuel Sanders or his agent about taking a pay cut, Tom Pelissero of NFL.com tweets. At this time, it sounds like Sanders will be a Bronco in 2019, Pelissero adds. Sanders made waves this week when he indicated that he will not consider taking a pay cut from Denver. The Broncos could still theoretically make that request, but as of this writing, they have not done so. Ultimately, Sanders might not have much to worry about as the Broncos appear to still have him in their plans. Sanders recorded in 71 catches for 868 yards and four touchdowns last season. He also rushed for a touchdown and threw a touchdown pass. Those numbers weren’t in line with his previous career bests, including a 101-catch, 1,404-yard season in 2014, but big numbers were hard to come by on a listless Broncos offense in 2018. In theory, the Broncos could cut Sanders and save his full $10.25MM salary against the cap while eating his bonus proration of $2,687,500. But, cap space is not at a premium, even when factoring in Joe Flacco’s contract. We should know the score in a matter of weeks – $1.5MM of Sanders’ $10.25MM salary becomes fully guaranteed if the Broncos exercise his option and a decision must be made by March 12. Broncos wide receiver Emmanuel Sanders is set to enter the last year of his three-year, $33MM pact with the Broncos, and he is due a $10.25MM salary in 2019. He will be 32 next month, and he tore his Achilles in December, but he has no intentions of reworking his deal, which carries a nearly $13MM cap hit next season. 104.3 The Fan asked its Twitter followers today if the Broncos should approach Sanders about a restructure, and Sanders tweeted, “it ain’t happening..no way Jose.” Troy Renck of Denver 7 ABC sides with Sanders, saying that there is no need for him to rework his deal, and that it would be foolish for the Broncos to trade for Joe Flacco and then let a veteran receiver of Sanders’ caliber go (Twitter link). Of course, there is a difference between a restructure and a pay cut. Sanders clearly interpreted the hypothetical question as “should the Broncos approach Sanders about a pay cut,” and if that’s the case, then his stance (and Renck’s) is certainly understandable. But perhaps the two sides could come together on an extension that would buy Denver a little cap relief and would result in a little more guaranteed money in Sanders’ pocket (though the fact that he is rehabbing from his Achilles tear could mean, as Charean Williams of Pro Football Talk observes, that the Broncos will not be addressing Sanders’ future for at least the next few months). The Broncos could cut Sanders and save his full $10.25MM salary against the cap while eating his bonus proration of $2,687,500. But they are not really pressed for cap space even after they absorb Flacco’s contract, especially since they are likely to cut or trade Case Keenum and save $11MM as a result. It seems more likely that they will simply wait to see how Sanders’ recovery progresses and either approach him about an extension this summer or else let him play out the final year of his deal and see what happens in 2020. In any event, we should have another update in the next couple of weeks. Mike Klis of 9News points out that, of Sanders’ $10.25MM salary, $1.5MM becomes fully-guaranteed if the Broncos exercise his 2019 option, which they must do by March 12 (Twitter link). Klis presently expects the Broncos to pick up the option, though he concedes it is difficult to predict what GM John Elway will do. In his 12 games last season, Sanders hauled in 71 catches for 868 yards and four TDs. He also rushed for a touchdown and threw a touchdown pass. On Wednesday, Emmanuel Sanders‘ season was cut short when he torn his Achilles during practice. On Friday, the veteran receiver underwent successful surgery and is expected to miss six-to-eight months, the NFL Network’s James Palmer tweets. The loss was a huge blow to the suddenly resurgent Broncos’ playoff chances. Though the team has won three consecutive games, it will have to replace its top receiver with a collection of rookie pass catchers in Courtland Sutton and DaeSean Hamilton. Sanders had posted 71 receptions and 868 yards before the injury and was on pace for one of his best seasons in the league. With four games remaining, the nine-year veteran was well on pace to post his fourth 1,000-yard season and was likely to record his second-most receptions in a single campaign. The rehab time frame sets him up to return for the 2019 season, which will be the final one on his contract. Though expected to make $10.15MM in base salary next season, the Broncos can release him with just $2.687MM in dead money. Awful news out of Denver. During Wednesday’s practice, Broncos wide receiver Emmanuel Sanders suffered a torn Achilles tendon, according to Mike Klis of 9News (on Twitter). Sanders is the team’s top receiver and losing him is a huge blow to the team’s playoff hopes. The 6-6 Broncos are riding a three-game winning streak, but they’ll have to make their late season push without the help of their best offensive weapon. Prior to the injury, Sanders hauled in 71 catches for 868 yards and four touchdowns. Statistically speaking, he was on pace for his second-best season behind a 2014 campaign in which he had 101 catches for 1,404 yards and nine TDs. The Broncos have lost three other starters (center Matt Paradis, left guard Max Garcia, and tight end Jeff Heuerman) to IR over the past month and cornerback Chris Harris could be next depending on how fast he can recover from a fractured fibula. The Broncos have an easy draw in the 2-10 49ers this weekend, but they’ll be at half-strength for the rest of the regular season, including a Week 17 matchup against the Chargers. In hindsight, the Broncos may or may not regret their midseason trade of Demaryius Thomas. Of course, hindsight is 20/20, and the Broncos will have to bank on youngster Courtland Sutton even more going forward. It’s likely that Tim Patrick will line up on the opposite side of Sutton the rest of the way with DaeSean Hamiton stepping into Sanders’ role. Sanders, 32 in March, is under contract through next year with a cap number of $12.9MM. It’s worth keeping an eye on his recovery – which often takes 7-8 months – as the Broncos can release him with just $2.687MM in dead money. Following in the footsteps of Plaxico Burress, Emmanuel Sanders has thrived after leaving the Steelers. Pittsburgh’s permitted many of its wideout finds to depart over the years, prioritizing only long-term partnerships with Hines Ward and Antonio Brown this century. In advance of the latest Broncos-Steelers game, Sanders said (via the Pittsburgh Tribune-Review’s Chris Adamski) Mike Tomlin told him prior to 2014 free agency the Steelers “didn’t have the money to pay me.” Denver added Sanders to a $5MM-per-year accord then extended him two years later. The Steelers have let Sanders, Mike Wallace, Santonio Holmes, Martavis Bryant and Antwaan Randle-El go either after the wideouts’ rookie deals expired or, in Bryant’s case, trading him away. But Pittsburgh continues to find wideout talent, with JuJu Smith-Schuster being the latest such discovery. After an injury-plagued 2017, Sanders (763 receiving yards) is on pace for his fourth 1,000-yard season in five years with the Broncos. He’s signed through 2019. Despite a $10.15MM base salary next year, the 31-year-old pass-catcher may be in line to play out his contract. The Broncos traded Demaryius Thomas, with Courtland Sutton waiting in the wings, but don’t have an obvious Sanders replacement lined up just yet. It doesn’t sound like Matt Slauson has immediate retirement plans, despite suffering a scary back injury, Zak Keefer of the Indianapolis Star notes. The first-year Colts lineman has contributed plenty to the cause despite being sidelined for much of this year, with Keefer noting he’s helped Indianapolis’ younger linemen. The Colts haven’t allowed Andrew Luck to be sacked in 214 straight pass attempts; that’s the longest since the Redskins kept Mark Rypien upright for 252 straight pass plays during the franchise’s 1991 Super Bowl season. Slauson continues to work out with teammates but is 32 and only signed through 2018. Both Joe Flacco and Alex Collins missed the Ravens‘ Thanksgiving practice, per Jonas Shaffer of the Baltimore Sun. Flacco has not practiced since suffering the hip injury that has him sidelined. He’s expected to miss at least one more week, giving Lamar Jackson another audition opportunity. Collins played last week but has dealt with a foot injury throughout the season, per Shaffer. Signs continue to point to Josh McCown receiving another Jets start. Sam Darnold did not participate in team drills Thursday, missing a second straight day of such work, according to the Associated Press. The rookie starter suited up Wednesday for the first time since straining his right foot but did not throw a pass in individual drills. McCown appears to be in line to face the Patriots, with Todd Bowles indicating (via the New York Post’s George Willis) the team will err on the side of caution. So, unless Darnold makes some significant strides by Friday, he’ll likely rest for at least one more week. 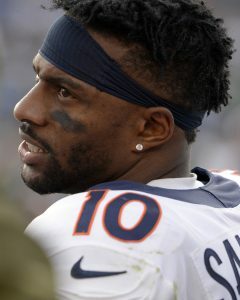 Teams are calling on Broncos wide receiver Emmanuel Sanders, as Jason La Canfora of CBSSports.com tweets. The Broncos would prefer to unload Demaryius Thomas‘ bloated contract, but Thomas wouldn’t net them much (or anything) in a trade that would effectively be a salary dump. This jibes with a previous report from Adam Schefter of ESPN.com, who hears that the Broncos are willing to part with Thomas, but not Sanders. The Broncos are understandably reluctant to part with Sanders, who is on pace for nearly 1,300 yards this season. Thomas, meanwhile, has just 372 yards through seven games, making him more than expendable. Teams could be intrigued by the possibility of Thomas getting back to his old form, but his contract is a major barrier. The 31-year-old is signed through 2019 with cap numbers of $12MM and $17.53MM in the next two years. Even teams with ample cap room would be wary of that obligation and would be unwilling to sacrifice much in the way of draft capital for the aging receiver. Teams are also reportedly interested in cornerbacks Bradley Roby and Chris Harris, but it’s unclear as to whether the Broncos are willing to part with either player. Per Ian Rapoport of the NFL Network (video link), many Raiders players believe that head coach Jon Gruden is simply not happy with his collection of talent, and that there will be major roster turnover within the next several years. In fact, those players feel it will take up to two years for Gruden to assemble the type of roster he wants, and while rival GMs are not sure they can swing a deal with Oakland GM Reggie McKenzie alone, they believe they can make headway with Gruden. The Raiders are clearly in a state of upheaval right now, and the sense is that everyone on the team is available for the right price. Raiders receiver Amari Cooper is clearly available via trade, and Rapoport says that the team has had the most significant discussions about Cooper with NFC East clubs, including the Cowboys. Adam Schefter of ESPN.com confirms that Dallas is doing its due diligence on Cooper, and Albert Breer of TheMMQB thinks there would be teams willing to part with a second-round choice for him, though it does not seem likely that Oakland will get the first-rounder it is reportedly seeking. Breer reports that the team wants a third-round pick in exchange for safety Karl Joseph. In addition to Cooper, the Cowboys are monitoring Dolphins WR DeVante Parker and Bills WR Kelvin Benjamin, according to Dan Graziano of ESPN.com (via Twitter). The Eagles have also spoken to Miami about Parker, according to Armando Salguero of the Miami Herald (via Twitter). Teams are very much interested in Broncos receivers Demaryius Thomas and Emmanuel Sanders and corners Bradley Roby and Chris Harris, per Jason La Canfora of CBS Sports. 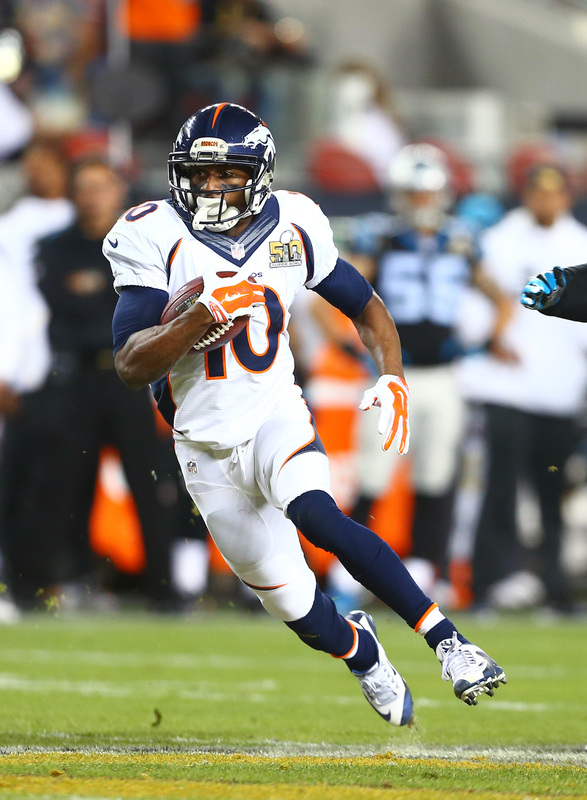 Schefter writes that Denver is willing to part with Thomas, but not Sanders. The Saints and Eagles are expected to be among the most aggressive teams in advance of the October 30 trade deadline, per Jason La Canfora of CBS Sports, who adds that the two clubs are interested in a few of the same players. Interestingly, La Canfora writes that Philadelphia is still monitoring the trade markets for Le’Veon Bell and LeSean McCoy, though recent reports surrounding both running backs suggest that they will be staying with their current teams. Jeff McLane of the Philadelphia Inquirer says it would not cost much to get McCoy, despite what the Bills have been saying, but it does not seem likely that the Eagles will reunite with their former star. Instead, in keeping with previous reports, it sounds as if the Eagles are content with their running back situation, and Zach Berman of the Philadelphia Inquirer tweets that the team sees a defensive tackle, secondary help, and a field-stretching wide receiver as bigger priorities. La Canfora also writes that the Eagles are seeking another receiving option and a quality corner, and he says the Saints are looking for upgrades at the same positions. The Raiders are said to be shopping Amari Cooper, who is probably the best wide receiver who could be had at the deadline, but Larry Fitzgerald and Emmanuel Sanders may also be in play. Meanwhile, Eli Apple, Gareon Conley, and Bradley Roby are some of the corners who have been attracting the interest of rival clubs. The Saints are currently 4-1 and are atop the NFC South, and they are clearly in win-now mode as they hope to bring home another Lombardi Trophy before Drew Brees, 39, hangs up the cleats. The defending champion Eagles are just 3-3 but are very much alive in the wide open NFC East.